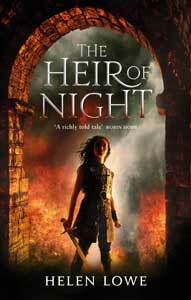 The recent unveiling of the US and UK covers for Daughter Of Blood — and now the new look US covers for the whole WALL of Night series — has inspired me to spend some on-blog time with the characters from the first two books in the series, in the same way I spent time on the worldbuilding in A Geography Of Haarth. “…the two priests retained their cautious station down the hall. Their faces had remained expressionless throughout, but the young woman was flying two spots of color high in her cheeks. Teron’s belligerent stare shifted back to them. “I still say they shouldn’t be here,” he said loudly. “Just what we need,” said Garan. “A coterie of Stone priests.” He had led his company out of the Barren Hills just on dusk, intending to camp overnight by the Border Mark, only to find another group of travelers already settled in by the standing stone. And not just any travelers, Garan thought with an inward groan. Stone priests were the nearest thing to a warrior class within the three priestly Houses, and as rigid as the House of Blood in their adherence to the divisions that had arisen out of the civil war.